hi, i'd like to enter the give away. Thinking outside the box, I think what we do to save money is making the most of our less-than-ideal gardening room. One of my favorites is that we innoculated a bunch of oak logs (recently cut down and free) with shitake mushroom spores. Because mushrooms like shade, we put them under a porch area. I just started my first flock of backyard chickens (5 birds). I've absolutely fallen in love with them! 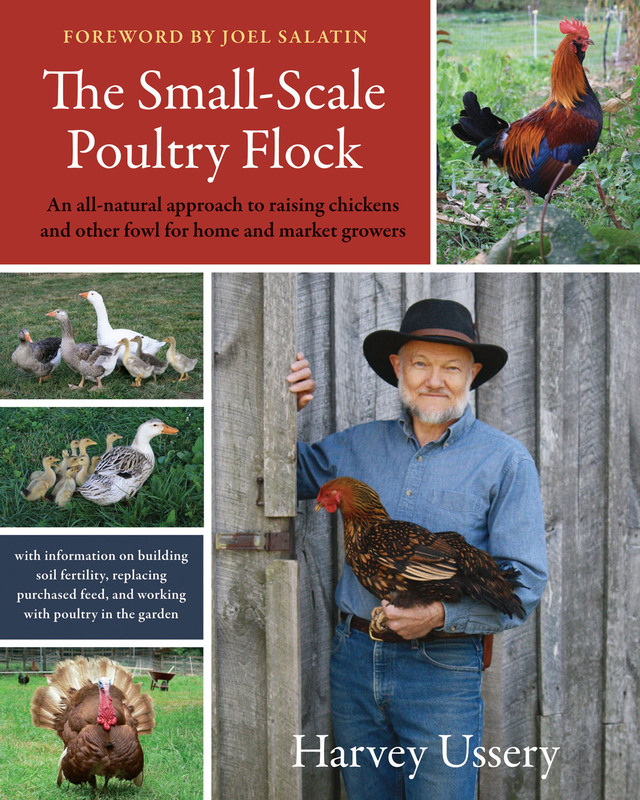 I'd love to have this book as I hope to learn more on their care and expanding my flock in the future. Thank you for the give away! Many people living out in the country have drilled wells, but when the power goes out the electrict pumps don't work. I use a hand pump I got at Tractor Supply, an adapter and a garden hose with a weight taped to the end so I can put it down the well pipe, which allows me to continue to have water in the case of a power outage that lasts longer than 24 hours. Got the kinks out and it worked well during the aftermath of Hurricane Irene. Have a post about it over on my blog. Water is the one thing can't do without for long periods of time. Hope that this is what you are looking for. I brew my own beer and after the boil part is done, I have to chill it down to a temperature yeast will tolerate pretty quickly. For this I use an immersion chiller that uses lots of water. So - I run the hot 'waste' water into the washing machine where I use it a 2nd time to do a load of laundry. The laundry is tied to a gray water system, so I use the water a 3rd time to water the fruit (peach, plum, loquat and fig) trees. I also feed the spent grain to the chickens - they love it. We got our first chickens this past May as 2-week old chicks and they just started laying at the end of September. Yesterday was our first '2 egg' day. Very exciting for us! Thanks for running the giveaway - I'm also interested to read the rest of the ideas people post. I have a few mini things I think we do or I do. I feed the leftover cereal from the kids to the chickens and I use a bbq grill brush for the grate on the rabbit hutches where the chickens are. I also pick free fruit and make wine or pie with it. krazy glue in my first aid kit. No joke. Most of our injuries out here (we're 30 minutes from town) are ripped fingernails, fingertips, and what have you. Cheaper than fancy bandaids that come off easily and don't hold the wound together, and if you clean out the wound really well, works better at holding nails on than anything the DR can do. In a pinch it'll get you to the ER if you need it! here's a tip I picked up from my dad. water the garden with dish water and bath water. He said they never had problems in their garden on the farm growing up because his mom made him and his brothers throw the bath water out in the garden. it waters the garden and the soap also helps protect the plant and drive bugs away. I use a natural bath soap and dish wash soap, so I have no qualms using it to water the garden. Like most people I do all the *basic* stuff but am always surprised when people tell me they are frugal but go on to say something that shows they're not. ** Don't use paper throwaway products, use cloth. Paper towel, sanitary pads, toilet paper, serviettes etc, use cloth, wash, reuse. ** When cooking turn the heat off before the food is cooked and it will keep cooking, Save gas or power. You don't have to boil the eggs for the whole 3, 5, 8min. Bring to boil and leave in the hot water, they'll finish cooking. **Serve less so there is less wasted food, especially to kids. ** Grow some food, it's not hard and it can be fun. **walk instead of paying gym fees. You get my drift, go back to the basic stuff and add more as you get the hang of things. My garden season is almost over, and my plan to clean up the garden area is to fence it with electric poly fence and let the feeder pigs loose in there for their last few weeks with us. They have a round bale for shelter and bedding, which they will spread and work into the soil while eating all "leftover" plant material, tilling, and fertilizing, all without me having to scoop up frozen yucky squash and tomato vines or take out a gas or me-powered tool. This summer I put up hay. I cut the hay with a two-hand scythe, turned it with a field-fork (longer tines, spread wider). I laid the cured grasses on the wheelbarrow (it makes a convenient height, and makes reaching under the bundle to pass the twine a bit simpler), and tied into a bundle with garden twine, then stacked it in the barn. I gathered volunteer Johnson grass from the roadside ditch, and from a patch growing next to the grove. I figure they run from 5-12 pounds, which should do the pony a day or three. The pony eats most of the hay; the Johnson grass growing in his pasture he nibbles on the tips. What I cut from the pasture he mostly left to cure for me; he appreciates the tender new growth that follows, until it starts getting a couple feet high. Now, if the neighbors would put up their silly dogs, I could turn the chickens out to keep the bugs in line. Grasshoppers. Gack. I'd like to enter the book thing, too. We are currently in the process of moving to a small farm (small scale homestead) where we will reduce our eco-footprint by using as many recycled products as possible in it's constuction, and where we will live off grid. I am also determined to grow as much of our food as possible - including owning a couple of chickens in the not too distant future ;) I have spent the past couple of years documenting our transition from urban to rural living on my blog. For instance, using a solar oven in summer reduces your dependence on grid power. To keep your grid power consumption lower during the cold months of winter use a hot (hay) box, wear more clothing to keep warm (instead of switching on a heater) and you can even create simple warmth by hugging microwave or wood stove heated bean bag s you relax in your living room of an evening. We have employed both these cooking methods and have vastly reduced our electricity consumption, whilst creating a meal which is filled with goodness, nutrition and flavour which has not escaped in the steam of a stove cooked meal. And both of these methods free up your time as you're not tied to a stove :) All it takes is a little bit of forward planning. And to reduce your energy consumption further, bring out your muscles LOL. Off grid eco-friendly kitchen appliances (hand operated) can be purchased cheaply, and whilst using them I am provided with quiet time for mental contemplation, and I have the added satisfaction that my "power" alone has resulted in creating our meal. So much rush today - why? Most modern appliances don't appear to be saving much time, as people are rushing about more and more. And, finally, in order to reduce our water consumption, I am experimenting and documenting the use of sub-irrigated planters and straw bale garden beds. I really have just started the frugal journey. But one thing we have done is saved up each year to buy beef that is locally grown. This way I know what goes in. I classify this as frugal as with all the stuff they use in commercial beef it saves on medical bills down the road. This year, my family has agreed to exchange only hand made gifts. I am making socks from my family, but all of my yarn has come from 2nd hand stores. We have our first garden this year and tomatoes canned and put up. My littles have been a big help. My oldest grandson (11) wants a small flock of chickens, this is actually on his wish list for Christmas. If I win, I will pass the book on to him. My daughter and I homeschool her 3 littles and we buy nothing new. We look for treasures at thrift shops and online when we need something. Congratulations on the new gig! And thanks for the link to Harvey's site. The eggplant Parmesan recipe looks interesting, can't wait to try it. Every morning we use our old coffee maker to brew tea. The tea is transferred to reusable glass bottles (thick walled, wire bails)that go to work with us. Oolong for him and homegrown lemongrass/mint for me. We save money on the cost of purchased beverages and we save the environment by not using all those single serve beverage containers. 4 beverages x $3 = $12/day, $60/week, $240/month! Oh, hooray! This is just the opportunity I need to de-lurk and say how much I love this blog. I love it from the bottom of my antipodean heart. Also: the biggest source of saving I've had all year (bigger than preserving the olives we picked from the olive trees grown in our local shopping centre carpark, bigger than home-grown peaches, bigger than soaking my lentils for eight hours to reduce the time spent boiling them, not as big as selling the car, but still pretty big) has been Project Never Buy Clothing Again. PNBC is helped a bit by the fact that I spent my 20s frivolously stocking up on all sorts of frou-frou nonsense and I've now got enough frou-frou nonsense to see me out for the next ten years, but even were that not the case, I can't speak highly enough of what you can do if you know how to sew. Bedsheets that are worn through in an unpatchable patch can still supply the makings of a pair of pyjama pants, too small flanelette shirts make a nice pair o' knickers, etc. I have spent exactly $0 on clothes in the last twelve months and I hope the clothes budget remains thus. Kate, that's fantastic news about the conference! I'm so glad you said yes. Harvey wouldn't have asked you unless he thought people could really learn something from you. Unfortunately I'm a couple of thousand miles too far away to attend, but if not I'd be there like a shot! I have 2 dogs, and I never come back from walking with them without a handful of greenery for the chickens, a bagful of hedgerow fruit,a pocketful of acorns or a handful (armful!) of sticks for the stove. I use the water I've boiled potatoes in to make bread- it improves the texture. I've posted my best chutney recipe before, I think- Green Tomato Chutney- definitely worth trying if you have unripened tomatoes IMO!It is very different to American pickles. Favourite cheap meal that's not the obvious mostly garden vegetables? It uses imported lentils (though if I buy Puy Lentils, they come from France, so not too far) but we love Megadarra- boiled rice (OK, also imported)and cooked green lentils (preferably cooked with garlic)topped with lots of caramelised onions that have been fried in olive oil.Middle Eastern peasant food for hundreds if not thousands of years and tastier than it sounds! If you substitute the green lentils for red split lentils it becomes Masafi. The last thing I can think of that makes my family laugh is I keep an old fashioned solid iron on the wood burner and iron our beds to warm them before we get in in the winter. It works as long as you get in straight away! My saving tip has to do with children's movies. I'm young, 24 and don't have any VHS from when I was a child. My son is obsessed with movies and that mostly includes Thomas the Tank Engine. The DVDs are so expensive and even at Good Will they cost about $4 each. I decided to change it up a bit and go BACKWARDS in technology. I bought a $5 VCR which still works 6 months later. VHS tapes are 49c each at Goodwill. I pop in there about two times a month and load up on 10 new tapes. If he gets bored with the old ones, they get redonated. I can't even rent a new movie for 49c. It keeps him happy and movies rotated so that I don't go nuts and it's way, way inexpensive. It has built up our movie library fast. I reckon the most money-saving thing I've done yet is to carry something edible and a bottle of water in my bag. I've a shoulder-bag/backpack that comes everywhere with me, containing books and pens and so on; I think most geeks have a similar one. Having something to eat and drink in there has saved me an open fortune in buying snacks and drinks when the need arises - particularly in winter, when public transport issues can give rise to long waits. This is great! What I have learned is to start slowly. Six years ago we got bees, then 2 years later ducks, this spring we got two mini dairy goats. All this time we have had a garden. Adding on slowly means there is plenty of time to research and explore. I visited people with the animals I wanted and looked at their set ups and read tons of books. Not only did I learn about the critters, I also built relationships with the people who know way more about them than I do. In turn, I try to share what I know with those who are interested. The more people interested and savvy, the better for all of us. What a great idea! I love to read what other people do. To stock up on meals, I make a double or triple batch of something like soup, chili or stew every monday. I save what we are going to eat that night and Tuesday night, and then pressure can the rest while watching House. I end up putting up about 4 quarts of prepared meals every monday. We water our garden out of an old cistern. Had to go down in and waterproof it as it was losing water but it was worth it. I also save bath water and use it on the flower beds and trees. I am a "from scratch" cook, I never use mixes or pre-made frozen stuff. Since being retired, I've grown a garden every year. Drought this year and last have limited me. We planted fruit trees last fall. Some of them may start limited bearing next spring. Lately I've been trying to wean my family off paper products as much as possible. Use hankerchiefs instead of kleenex, made myself some cloth "wipes". We still use paper for #2 because I don't want to wash that. But you'd be surprised how long bathroom tissue lasts around here. We go to garage sales and buy a lot of the things we need there. Much cheaper than buying new (for instance, a pea sheller for 50 cents that goes for $30 on Amazon) and no sales tax to pay! You use up your gas but if going to garage sales is your entertainment, it works out, and many times the savings you get on things more than pays for the gas. I love this idea for a contest giveaway!! First, I love the "Swiffer". Yep, I love its convenience and ease of use. I do NOT, however, love the cost of the cloths we are supposed to buy to go with it. Well you know the rag bin? I just marry the two. Especially with stained old tshirts - I just cut them to fit the swiffer and I now have a seemingly endless supply of cleaning cloths for it. Second, feeding people, especially children. If you bring them to my house, I have rules about what and how they eat. For example, I put SMALL portions of everything on a plate. Children 3 and over are expected to clean it before getting seconds of their favorite food. This ensures a few things: they eat a little of everything and widen their palate, they only get seconds if they are truly hungry for them (I've had children take one bite of their second serving of something and tell me they were full - they had to eat it anyway), and food doesn't get wasted. They are also expected to drink their milk! I can't believe the number of parents I have come across who don't expect their children to eat or drink their milk. It's so wasteful!! And since everyone else seems to be talking about their land, well, I have five acres I'm moving onto in May. There's nothing there, not even a driveway. I bought a cheapo camper my son and I will live in while building our dirtbag house; he'll have chickens and rabbits; I WON'T have a mortgage or utility bills. Of course I'll have to get a well drilled (As the pond I put on it wasn't as big as I wanted and won't yield that much water...). This means I won't NEED to have a job to pay my bills - I can work 2 days a week and be just fine, and the rest of the time concentrate my efforts in frugality and growing our food. We won't be chasing money in the beginning (any longer, at least) and in the end won't be using that money to pay for medical problems brought on by our money chasing activities. CAN'T WAIT!!! I think the best tip I can come up with is to wait. I wait to purchase every big item that my husband and I think we need, figuring that if we forget about it, it wasn't important enough to buy in the first place. If after a while we realize it is important, then we plan the purchase so we're either spending less or buying it used, and usually both. Often, we end up making the item ourselves. It's saved us a lot of money in the long run and encourage our ingenuity. Congrats on your upcoming talk! Gives me butterflies just thinking about it, but you'll be great. I tried to read everyone's posts first so I wouldn't repeat an idea, but you've had a huge response. I can think of three things that may not have already come up. First, we do not buy tissues (Kleenex) or paper towels. We use the old style handkerchief for runny noses...including my young daughter, who calls her pink one a "booger-rag". Cotton is so much easier on my nose than paper and with our long winters, my nose runs nonstop. I also have a sensitivity to the perfumes and lotions tissue manufacturers like to use. Second, we have reduced our garbage down to 1 kitchen bag a month by composting and eating from our garden, which reduces packaging waste. Instead of paying for a weekly trash pickup, once a month I drive our recyclables and single bag to the local dump and pay about $2 for disposal. Finally, I seal our upstairs windows with shrink plastic during the winter. I only do it upstairs since that's where heat tends to go. We don't look out those windows during the day so it isn't bothersome. It's cut our heating usage down in a huge way. Also, if you skip the shrinking part, the plastic is totally reusable for many years. I just buy fresh double-sided tape. Here's a (maybe obvious) gardening tip. If you are like me and start many plants from seed you wind up transplanting a lot. I start seeds in flats with sterilized "soiless" mix, and then transplant the plants to larger pots with organic soil once the plants are of suitable size. I get tired of doing this ... So, I have taken to using the larger cups/pots from the getgo, filling them with the organic soil save for a small region that I scoop out and fill with the soiless mix. The young seedlings germinate well in the soiless mix, the surrounding "real" soil helps hold moisture in, and as the root systems of the small plants grow they work their way into the "real" soil which contains nutrients. Some might argue against this much work up front from a germination rate standpoint, but I find that if I use good quality seed I have very high germination rates. Further, for any pots that have poor germination, I just pull out the not-so-great seedlings and re-plant with whatever plants I'd be planting at that later time anyway, so nothing is wasted. This process elminates transplanting which is just really boring to me and gets old. Thanks for the giveaway offer, I'll be buying the book even if I don't win! Also, I believe you already have my email. I love Harvey!! He has the neatest ideas!! My best frugal tip is, simply, wait before you buy. It seems obvious and may not be necessary for everyone, but I have found that too often I am tempted to buy a new (or new to me) item right away when I am doing a project. But often, if I make myself wait, my brain kicks into overdrive to solve the problem of not having the new item and I will find another solution...repurpose something else, redesign a process so the new item is not needed, borrow from a neighbor...or simply keep waiting until I find what I need very cheap, free or in a situation where I can barter for it. I usually wait two weeks...if it still seems urgent after that point I will buy...but often it doesn't anymore. Entering the giveaway to further our research. My boyfriend and I are in the process of learning and researching sustainable homesteading and the most frugal and sustainable way we live right now is as a blended houesehold. We live with my semi retired parents and my son in a duplex. This helps a lot in sharing incomes and getting all things household accomplished without draining our time, allowing us to take care of the garden when we are not at work. Once my parents discovered that we wanted to live out in the country on a small scale farm they convinced us (rubber arm like) that they should come along. But we need to learn, learn, learn and I really think this book will help. Checked at the University library and the public library (a very frugal idea for reading books) but it's not there yet. Love reading the blog by the way and have already gotten lots of ideas from it. Chickens are in our near future and would love to avoid as many mistakes as possible. We save all meat bones and scraps, no matter how small, in the freezer along with odds and ends of veggies. When we have enough for a potful, I simmer it all day for a really rich soup stock. The longer you simmer it and reduce its volume, the more concentrated it is and the less space it takes to store. When it is done, I freeze some in ice cube trays and some in bigger blocks for cooking later. Well shoot - a lot of mine were suggested - like saving all bones and veggie scraps for my own stock and the canning. We do have a 3,000 gallon rain water cistern and that is what we use for our water supply. And we heat our house soley on wood in the fireplace before we have to kick on the heating unit. I am not sure I have any really interesting tips. I grow my cucumbers on the round tomato cages since they aren't really much good for tomatoes anyway. For snacks at work I take in homemade yogurt in a canning jar, fresh fruit or dehydrated fruits and veggies. A lot of my vegetable scraps go to the mealworms first which then go to the quail which then go on our table. I'm not nearly as far along as many here, especially living on a VERY shady, tiny city lot. However, we do our best and grow food in everything from stacked tires to an old kiddie pool, to raised beds made from a few odd pieces of lumber left by the last owners to a flowerbed turned garden area. And even tuck other food plants into the areas between the bushes in front of the house. I've got a clothes line that wraps from our electric meter, around a tree that straddles our property line to the other huge tree that shades our entire back yard. And we compost like crazy too. I think we are the only ones in our entire neighborhood doing anything of these things! On top of that I glean when I can, support our farmer's market like crazy and just 3 weeks or so from delivery baby #3 (also have a 3 and 1 year old) I'm finishing up canning and stocking the freezer like crazy. I'm guessing we'll end up with about 350 jars and about 40 meals or so to get us through the post natal period and the winter. 100 quarts of applesauce from very old, fence line 'organic' apples we got for free from an old friend. Lots of work to pick, especially with the kids and lots of work to put up, but it will be great all winter long! Moving to the country soon, hopefully and would LOVE this book as chickens will be the first animal purchase after we move! I think the biggest thing that I've been doing is cooking in batches and freezing. I'm not a fan of cooking once a month, but the idea is sound- I just make double and triple batches of foods I make- casseroles, pasta, even pizza! I store it in the freezer for nights when I don't feel like cooking. Love it!! I've thought of my equivalent of one of your tiny tips, which I don't think I've seen on any of the blogs I follow. On holiday in France, we noticed that some areas sell sacks of corn cobs for barbecues alongside bags of charcoal. I've since read of peasants in remote areas of Spain using them for fuel. Of course, it may not have been mentioned because everyone knows that, but we have a shorter history of growing and using corn here. Oh, and delete this post before you pick a winner if I've increased my chances by posting twice! When we take nightly walks through the neighborhood I pick up the deadfall sticks off the road and throw them in the bottom of the stroller. I get extra exercise reaching down. When we get home I can have a nice campfire and the kids get smores made with free fire wood. The charcoal that is made supplements the kitchen compost pile. My families biggest frugal living, cost saving adventure has been something called "Share Shed" We bought 12 acres out in the middle of no where in the northern part of Canada in BC, and you either burn your garbage or take it to the dump. Well at the dump there is literally a small shed with a sign on it that reads "Share Shed". It's a place you can take stuff to or take stuff from all for free, as it's things people don't need anymore. We have had such a riot NOT spending money on great treasures found there. Some examples are: Rototillers, lawnmowers, gazebo's, clothes, lamps, even found a tossed out jar of pennies! CRAZY what people will chuck out. The best time to go to the shed is just after a long weekend in the summer after the "city cabin" people have just left, cause the toss or bring all of there beer cans and bottles...OOOOHHHH BOY, so much fun when you get FREE money! I brew kombucha, 1 gallon at a time. when I brew the tea for it, I only heat up half a gallon of water to steep the tea in. it takes shorter to come up to the right temperature, and then after the tea has brewed, I can pour in the other half gallon of cool water to bring the temp right down so I can put the mother in right away. save energy and time! After finding my carefully planted and nurtured veggie seedlings massacred by a family of cardinals, I devised a simple "spinning scarecrow" underneath a ceiling fan on my covered patio. Now I position the seedlings directly under the fan on a table and the long streamers that I attached to each blade move in the wind creating a veritable no-fly zone for the hungry birds. It protects the seedlings without harming the birds so I am happy with the result. My best homesteading effort is my laying flock of four hens. Whatever food scraps we have goes to them and they lay wonderful eggs for us. That whole Americans throw away 50% of their food doesn't apply to us! My tip is about conserving water. We divert used laundry water to a reclaimed (and really attractive) oak wine barrel. We use this water on our back garden, on the little lawn and ornamentals. Water is shockingly cheap, but that doesn't mean that it isn't precious! I really love your blog, and read it often. My favorite trick is my chicken-powered compost bin. It's taken several years to learn how to make it work. If there's too much coarse stuff like corn stalks, or if the compost gets too wet, the chickens can't scratch down through it, so I pre-compost some of the coarser material in another bin, and I've added a tarp roof that I can open or close to control how much rain gets in. Once a year I clean it out and screen it. This is the softest and fluffiest compost I've ever seen. Ok, I think my best tip learned just this year has been to grow dry land potatoes. It never occurred to me to grow potatoes without watering them in any way but for the rain that comes from the sky during the course of a summer. I'm sure many farmers who grow acres and acres of potatoes would laugh at me, but I just didn't know you could grow a good crop without the benefit of extra watering. I read about another NW Montana gardener/ farmer who was trying the dry land method with potatoes last year and she really grew quite a great crop of reds. So I tried it this summer with pretty good success, too (about #200 from #50 pounds of seed potato). Why this is a money saving tip is obvious even for those of us fortunate to be on a well. But the reason I consider this a great tip is that there are some true nutritional food stuffs that I can count on to feed my family if for some reason I can’t get or afford the water it takes to keep a typical garden thriving. I plan on doing some research this winter on other dry land vegetables. I'm real excited about the possibilities. My tip is a gardening one - I plant radishes along with my carrots. The radish seedlings are quick to come up and mark the row and break any crust on my clay soil the whimpy carrot seedlings might not handle. They also help with the spacing of the carrots, reducing how much I have to thin them (a job I hate) and I get two crops for the space of one since the radishes are long since eaten before the carrots really get going. I cook roasts/chickens etc in the slow cooker. They will generally make a few meals. I save the left over juices and put them in a jar. Add dehydrated veggies, some noodles and a little water and you get soup for lunch for next to nothing! 1. Cancel cable, we use Netflix and the internet to watch a few select shows. Saves over $50 a month! 2. Built a root cellar to store sweet potatoes and squash over the winter. I'm posting the details tomorrow. 3. Learn to forage for native plants and mushrooms. Free food, excercise and great family time! These are just a few ideas that are still simple. Terrific. I would love to win this book. Please enter me. I'm a new reader who lucked into your giveaway. I'd like to say my best tip would be for all kinds of gardeners - plant early and plant often. Don't stop in July or August. Keep pushing the boundaries. The Nearings kept on planting! I've eaten fresh produce as late as December (in IL) and as early as February without benefit of greenhouse or hoop house. It's wonderful! First, I have to say I have learned more tips in the 1-2 weeks I have been reading your blog than anything I have come up with. I started with a compost barrel (http://www.instructables.com/id/Compost-Barrel/). However, as I was working in my garden getting it ready for the winter, I discovered it does not work as well horizontally. So ... back to the drawing board. At least I did not punch any holes in it so I can reuse it for abother purpose. I found an old rotten garden hose in the woods. I hooked this up to my water barrels and had my own drip irrigation system. That's all I have done so far ... my heirloom tomatoes did not do well and my pablano, banana & jaleopeno peppers are just starting to produce at the end of the season. I am using the 'lasagna' method described elsewhere to get my beds winterized. Can't wait to see how well this works next year. So ... that's all I have to contribute to the give away. I can be contacted at bqbowden@msn.com . A quick frugal tip--used dryer sheets work great on a swiffer to pick up loose hair in the bathroom. I keep a bag hanging in the closet to collect them in for quick sweep ups. Thanks for the chance at the book giveaway. My family hasn't made it to our little homestead land yet, but we have been working on a few small things as we are able to. We started making a lot of our own products. For instance, deodorant is 1:4 ratio of baking soda and corn starch. We spent around $5 a month on toothpaste, so why not make my own...minus all the chemicals! 50/50 baking soda and coconut oil (which I cook with regularly, yum!!) with a little mint oil and stevia for flavor. We attempted a potted garden this year in our little space, but most of the veggies seemed to fry in the sun and heat we had. Next year I will be able to do a real garden and will eat up some of the tips I've been reading. Personally, I can't wait till I have land and chickens! We eat eggs daily. Oh so soon! My new favorite is canning beans, specifically, shell beans. We had a fantastic year for black beans and canned 34 pints! Now when making chili or burritos we just open a jar instead of soaking for 8 hours. This looks like a great book, and would be perfect reading over this coming winter, as I plan on building a coop in the spring! I do alot of the basics and things already mentioned here: canning, scraps for stock, compost, recycle, hand tools in the kitchen, cook from scratch, garden, wildcraft, buy used, don't pay someone to do work you can do yourself etc. I also get amazing things from the transfer site (we don't have municipal garbage pick up, so everyone dumps their trash etc at the transfer site: there's trash bins and a covered "re-use" section. then the borough hauls it all to the dump once a week). Its incredible and ridiculous what people throw away! But, as far as unusual or non basic things; most of that has to do with living off grid in the far north. Alot of energy goes into keeping self and equipment and house warm. We keep the moniter stove set to about 50 degrees - to keep the pipes from freezing while we're gone in the day; but then just use the woodstove to heat the house to a 'comfort' level, and we try to keep it well enough stoked the moniter doesn't go on! We have heat tape on the pipes - from the well to the house, from the house to the septic - that we put on timers so they only run as much as needed for how cold it is. We also put a timer on the plug for the cars (have to have engine block and oil pan heater in the winter) - so it only runs for the couple of hours before we use them in the mornings instead of all night. We just bought our homestead, and I'm starting to work on making "Warm Window" (tm) curtains for all the windows. You can make your own warm window fabric too, out of canvas, quilt batting, and mylar. The mylar reflects radiant heat, and thermal imaging of a house before and after warm window curtains shows a CRAZY difference. It brings the R value of the windown up to that of a regular wall. In the windows we only use so often, or aren't likely to open the curtain frequently, we cut ridgid foam to size and insert that into the window sill too. Also, this is something I did growing up, and still do - Collect smooth river or beach rocks, a size like you'd hold in two hands, and put them on top of the woodstove in the evening. Keep a hot pad/oven mitt and a basket close at hand. Then when you're about to brush teeth and such, take the hot rocks and lay them under your covers. By the time you climb into bed, they're still warm, and you can push them all down to your feet. So you have a warm bed AND feet warmers to go to sleep with! It's wonderfull with flannel sheets especially! The only down side is then you have a bunch of cold rock in your bed in the morning. Wow. We manage to fit a lot of stuff into our little urban lot--grind flour, bake bread, make yogourt, make soap, sew, grow veggies, make sauerkraut, shop at thrift stores--and we are trying to grow mushrooms, make sausage and we slaughtered turkeys for the first time this year. But half of that stuff is not very frugal--eating local, organic food can be pricey. We just hope it pays off by strengthening our local economy. Making yogourt doesn't save much money, but it sure does reduce the amount of plastic going in the blue box. Here is my favourite recipe, we make it every year, and it is simple and delicious--the Anderson Family Dilly Beans. These are a crowd-pleaser and will save your bacon for potlucks. Heat 4C water with 4C vinegar and 1/2C pickling salt. Pack pint jars with green beans, with 2 cloves garlic, 1 tsp. dill seed and a drop of hot pepper sauce. Process for 15 mins for pints. Now for a real money-saving tip--set up searches for your homestead tools on craigslist. You can save searches to your RSS reader (Craigslist has an RSS button at the bottom of each results page)--then you don't have to type in every search whenever you happen to remember. Whenever a new item comes up, you are notified. I got my beloved Mill-rite flour mill this way, as well as lumber and glass for our greenhouse, an apple-picking bag, a sauerkraut crock, our pressure canner and innumerable canning jars. I run a co-op house of six people, so stretching food is a priority. We dumpster, grow our own, scrounge things from empty lots, and shop in bulk since we're trying to throw together a vegan, healthy meal every night for up to ten people. We have chickens, quail, a greenhouse, and a grow room. My favorite way to save money at mealtime is to have everyone contribute one ingredient to the meal. With this many people coming over, we can usually scrounge a few food blogs, one of our numerous cookbooks, or come up with something completely new using all of the things people have plus a few things from our kitchen. Some favorites that arose from this "ingredient potluck" dinner include butternut squash, potato and green apple turnovers (some with cheddar) paired with a big roasted pepper and eggplant rice salad, or a spicy thai-inspired basil stir fry with a lot of local garden veggies was a hit. The total cost per plate at these things is usually around 30 cents!! !